Stop my heart, my six year old was so proud of his dad's nerdy hobby. I will think back on this when he is a teenager and does not want to be seen with me. Impressive.....Most Impressive....But.... well actually, no buts.. it's just really impressive. anyone need a Baze or Chirrut? Did you find them at 5 below? My 5 below had nothing but the 2 peg warmers. Check Tuesday morning! They’re hitting there too. But at $7.99. That cant be. Theyre supposed to be 5 and below not above. I don't have any of those stores near me. Sure it can, Tuesday Morning isn't Five Below. yup..actually one of the stores that i totally forgot about until wifey reminded me. Nice, that gives me hope that I'll find them, might have to check out of town. bought this at target for $34.99 cuz i got them to price match it from their own website! Yeah man, I've never seen them at retail either, so when I heard they were showing up at 5 below I was beyond stoked, been checking my local 5 below periodically (also for legends GotG wave) but they haven't shown up, unless scalpers got to them, and the only legend I found was rocket raccoon which I just grabbed 2 days ago. they had a lot of whatever that black armored trooper is too..
i also grabbed that Krenic..i'd never get him for normal price..but for five..yup. I've wanted a Maz for the longest but REFUSE to pay 20.00 for it. Found it for 11.00 one time and still refuse..hhaha.. when i find her one day for 5 or 6 bucks..she'll be mine. Last edited by DarkToyLord; 10-15-2018 at 03:20 PM..
All my 5 below had was 4 jyns and 4 cassians. I don't even have any 5 Belows. Well you can always ask those of us who do to look out for ya. Most folk here are good about that if they can. I grabbed Krennic when walmart had him for $10 and the same store later dropped Maz down to $5, I recall at the time we discussed that being her ideal price. Now my stores need to clearance out all of the Solo figures that have been sitting around except I won't be picking any of those up even at $5. if they do that, i would pick up the range trooper probably! I don't care for the range trooper's look but the train heist was a standout sequence of the movie so I could see those guys being the first to go at clearance price. Last edited by Nitelife; 10-15-2018 at 04:34 PM..
Last edited by Tim; 10-15-2018 at 04:39 PM..
saw those at Gamestop for 11.00...WISH i had waited. The boots were Magnetic. They used them to walk on the train. Like most thou before seeing the film I thought their design was kinda stupid. Looked like a pimp from 70’s films haha. If i get range troopers imma replace ther scaffolding boots with snow trooper boots....of course then ill need snow troopers. Told myself I was done with Black Series until Dengar and Zuckuss get widespread releases, and then I run into these two at Walmart today. 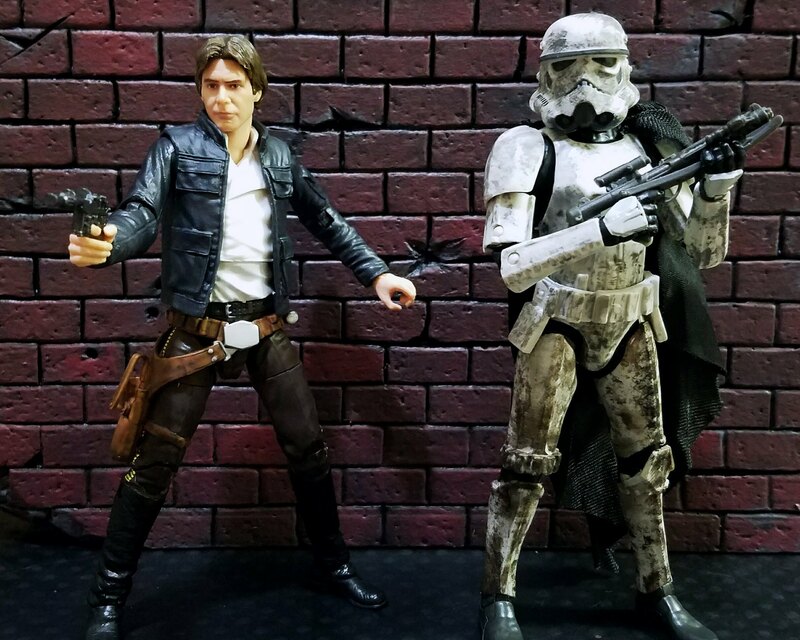 While the Han still doesn't quite look like Harrison Ford, it's miles ahead of where any of old ones were, and the Mimban trooper lured me in with that sweet space cape.